Went home a little late last night with my husband, eyes bloodshot, tried as much to subdue my emotions and forbade myself to well up, with the ever present lump on my throat, I rested on the truth that others felt the same as seeing them touch their faces, as if trying to hide the same sentiments. The words above are the bare lyrics of the song which have been echoing in my mind after having watched ANG HULING EL BIMBO, the song made famous by the iconic 90's band, Eraserheads, which became the very backbone of the new, sensational musical produced by Resorts World Manila, together with Full House Theater company and Ultimate Shows, Inc.
Sa panaginip na lang pala kita maisasayaw." This is RWM's 9th production, their second homegrown stories based on Filipino music (with Bituing Walang Ningning as the first). When they blurted out that they want to make the Philippines as "the Broadway of Asia," with the help of their Chairman Dr. Andrew Tan, I knew they are bound and determined. With the outcome of the ticket sales, they can clearly testify that all their hard works were paid off and as a viewer, they indeed have hit that special spot, at the center of every one's heart, who loves to watch Filipino talents. All along, I thought it will all be just singing and dancing to our favorite Eraserhead hits! Well, it's the story of the protagonist as said in Ang Huling El Bimbo song, after all! Nevertheless, it was only not something to revere the 90's hit with, it was like going down memory lane, remembering how it was in college, how life can be tough and how lasting friendship and love can still be conceivable despite the many tragedies that befell us. I'm not a theatrical reviewer nor anything like that, but after watching this, I came to moon over more on local theater productions and I hope RWM will produce more like this, souping out my creative writing skills, if I do have one. By any chance you have time, or planning a date with a loved one or with your college barkadas, this is one musical (for the records) one should not miss, and do bring a hankie with you too. Tickets to Ang Huling El Bimbo are now available at the RWM Box Office and Ticketworld outlets. Visit www.rwmanila.com or download the RWM Mobile App for more updates. Watch the video of the after-show graced by the songwriter himself Ely Buendia, whose songs became the lines to the musical. 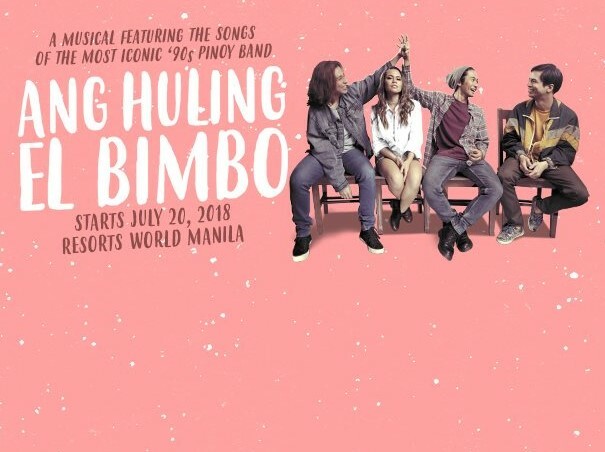 Huling el Bimbo is a song that also comes to my mind whenever you think about the 90's ❤ That's really a great a song that until now,millenials loving it too. I totally agree with you Joyce. Ay gusto ko rin yung kanta na yan maganda sya , kaso sad and ending. Ang galing nyo po magblog. Kahanga hanaga ang details ng mga words.